My home city is an extraordinary place. The local tourist board recently adopted a new marketing phrase ‘People make Glasgow’ which I was never really sure of. Too often some people in Glasgow leave me ashamed of the place. Too many indulge in sectarianism behaviour, violence, casual racism and begging to indulge their drink/drugs habits. ‘People make Glasgow’ was a phrase that could all too easily backfire. But the reaction to the tragedy of the helicopter crash on Friday 29 November and its aftermath has ensured that the new slogan is being seen in a positive light. That so many casual passers-by rushed to the aid of those trapped inside the building without giving a thought to the potential danger they were putting themselves in was something that everyone seems to have commented on and civic leaders and other politicians were quick to associate these actions with the new slogan. This tragic event happened when I was on holiday and it was only the next morning when I switched on the mobile phone did I pick up on what had happened. I had a genuine sick to the stomach feeling as The Clutha was a pub I had the occasional drink in and was a place that some friends were in the habit of going to of an evening. Thankfully, from my perspective, those friends were elsewhere that night although I’ve since learned that a colleague from my old workplace was inside, and while he escaped any serious physical injury he is unsurprisingly suffering from stress and is very traumatized. I wish him, and everyone who was caught up in the tragedy, a full and timely recovery. 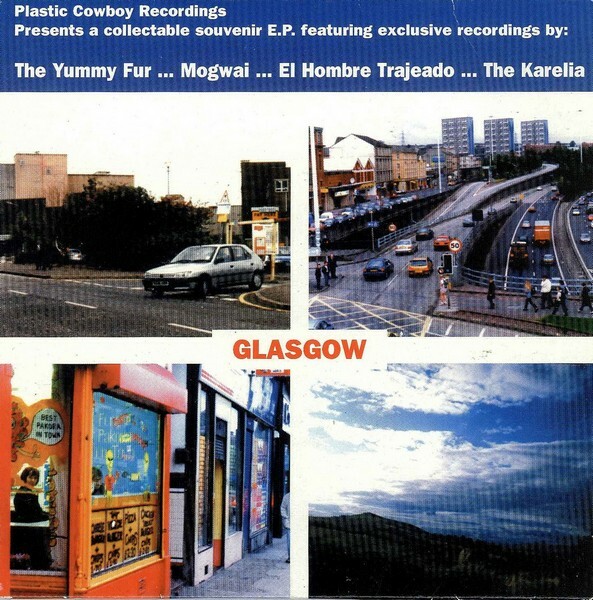 These tracks comprised the Glasgow EP, released on the Plastic Cowboy label back in 2000. It was one of a series issued by the label in which they took four singers/bands from a city or region and put out 2 x 7″ singles in a sleeve that had some very weird images of each place. The Glasgow EP was followed by efforts from Liverpool, Oxford, Essex and Tokyo (and came two years after The London EP which featured, among others, Hefner and Spearmint). The tracks are, for the most part, abit experimental and ones for connoisseurs of each of the acts and not the most commercial pieces of music ever committed to vinyl, but are all worth a listen. Mogwai are the best-known of the four, while El Hombre Trajaedo were a band that most Glasgow gig-goers will have caught at least once in their lifetime such was their level of activity and willingness to work with and support many better-known names. The two band on the other 7″ – The Yummy Fur and The Karelia – had personnel who would in subsequent years would find fame and some fortune in Franz Ferdinand. There is a hint of FF in both of the featured tracks. The vocalist in The Yummy Fur was John McKeown who some of you might know as the frontman of the under-rated 1990’s who released a couple of very good indie-pop LPs in the latter half of the last decade.